Robots are designed to perform programmed routines at particularly high working speeds with precision and accuracy, so the need to be both reliable and efficient are critical to the success of the application into which they fit. Manufacturers operating within fast moving markets, such as logistics & supply chain, food processing & production and automotive/Tier 1 need consistency of reliability on the production line, to ensure they are able to continue to give their customers what they want, but also to remain competitive. To ensure an application continues to operate both reliably and consistently, manufacturers now have access to data, applicable to a robotic cell that features within any given application. Valuable analytics that provide complete visibility on all aspects of the performance of a robot. This data resource, in the form of KUKA Connect, allows a manufacturer to transform their enterprise and achieve cost savings through best practice management. Access to data analytics; performance data, in real time, via KUKA Cloud, enables a user remote access from any device at any time, providing complete data visibility across their asset(s), leveraging vital statistics with a view to achieving optimum operational efficiency. Industry 4.0 dictates that automation and data exchange are shaping how manufacturing is and has developed. KUKA Connect further supports that transition. Connect enables real time notifications in robot state, allowing manufacturers to pre plan routine maintenance scheduling, minimising robot downtime and disruption to production lines. Cycle times can also be scrutinised. Transformation of robot data into informative visuals allows a user to identify if improvements in a cells quickest route to production can be achieved. Increasing efficiency and supporting increased product throughput. Three dimensional visuals allow the user to watch the robot’s movements in real time, whilst it is in operation. Condition monitoring and key performance indicators, from average energy consumption to average motor temperature provide users with comprehensive stats that are recorded, providing the user with an historical event log, again supporting the planning of routine maintenance, according to cyclical trends. KUKA Connect, in addition to providing a comprehensive overview of asset performance, enables users to monitor continuity of repeatability. 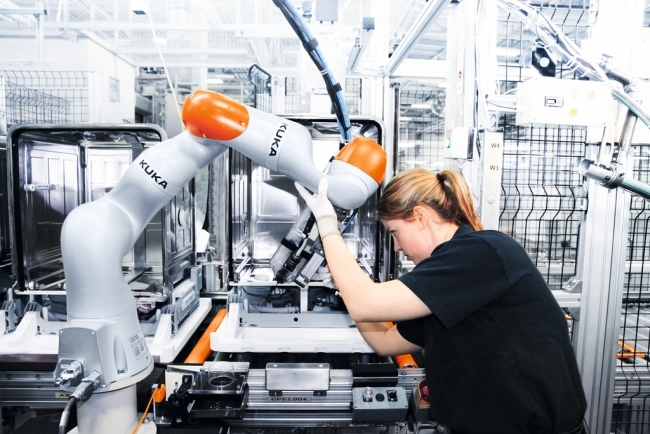 KUKA robots operate to a position repeatability of 0.03mm. Developed with precision and accuracy at the forefront of their design, KUKA robots do not require expensive downtime for recalibration purposes. If we consider environments such as automotive production lines and fresh food processing facilities, efficiency and accuracy are key. Especially so when competition is so fierce. The IoT is bringing automation and data closer together. It is also empowering business owners to significantly reduce operating expenditures, by increasing productivity through the acquisition of business specific operating data, via KUKA Connect. Connect also supports businesses with multiple assets across multiple sites, by providing a system status; split by robot groups, total robots and robots with Connect. Visibility of any one cell, or multiple cells, at any one time can be achieved, ideal for asset audit purposes, when planning routine maintenance and identifying areas for operational improvement (quickest route to production). Via the Cloud based application manufacturers are able to perform a number of tasks remotely; development of Connect will ultimately provide a robot centric environment, providing access to multiple parties; KUKA, customers, partners, integrators and authorised third parties. All will ultimately be able to access a number of key features to include; service, simulation, open API (application programme interface), optimisation & predictive maintenance. Whilst the IoT is providing manufacturers with the ability to better manage their operations, automation management is in many cases still being handled by traditional means; routine maintenance carried out without any prior analysis of robot performance versus productivity. 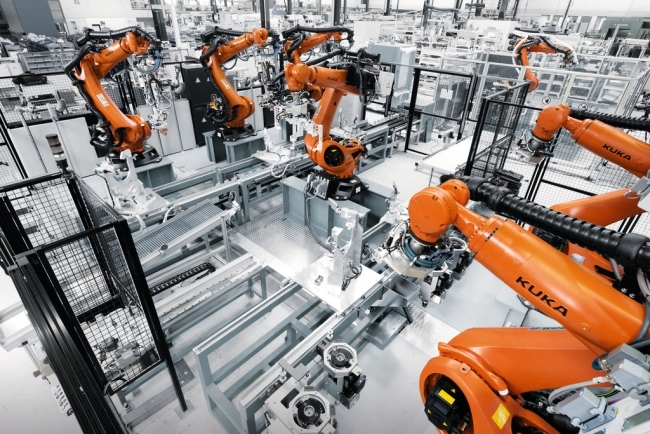 KUKA Connect not only provides visibility of all data applicable to any one asset, it can also be used to identify peaks and troughs in a robot(s) performance, aligned with the busiest and quietest periods within an operation. As we have already mentioned, downtime can be costly and impact upon the performance of an operation. Having to hand vital statistics that essentially dictate when routine maintenance should take place could allow a manufacturer to identify when a cell should be made redundant; weekends or evenings as an example, outside of busy or peak periods. So to summarise, whilst there does exist the need to carry out routine maintenance on robots within an automated application, there also exists the need to be aware of the impact on product throughput this can have. The IoT is providing a plethora of solutions that can future proof operations as we move further into Industry 4.0, allowing manufacturers to operate efficiently and cost effectively. As the partnership between automation and data continues to evolve, so manufacturers should embrace this evolution.